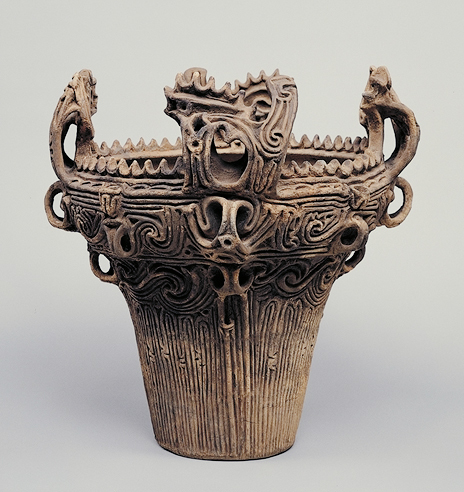 In the mid-Jomon period, extremely decorative pottery with elaborate handles were produced in areas around Shinano River in Niigata prefecture. Because of the flame-like decoration seen in the upper half portion of the vessel, this type of pottery is often called “flame-style”, although its official name is “Umataka-style”, having been first discovered at an excavation sight in Umataka of Nagaoka city in Niigata The deep bowl illustrated here has a large mouth with four bird-shaped handles around its rim. The outer surface is decorated with cords of clay in a complex design of meandering lines. There is a sense of movement in the shape of the bowl, and a powerfulness created by the numerous projections of various sizes, making this vessel one of the best examples of its type.